Vic Gout is Professor of Computing Futures at Wrexham Glyndŵr University in Wales. He is a professional ‘futurist’ with a particular interest in the social, political, ethical and moral dimensions of technological evolution. 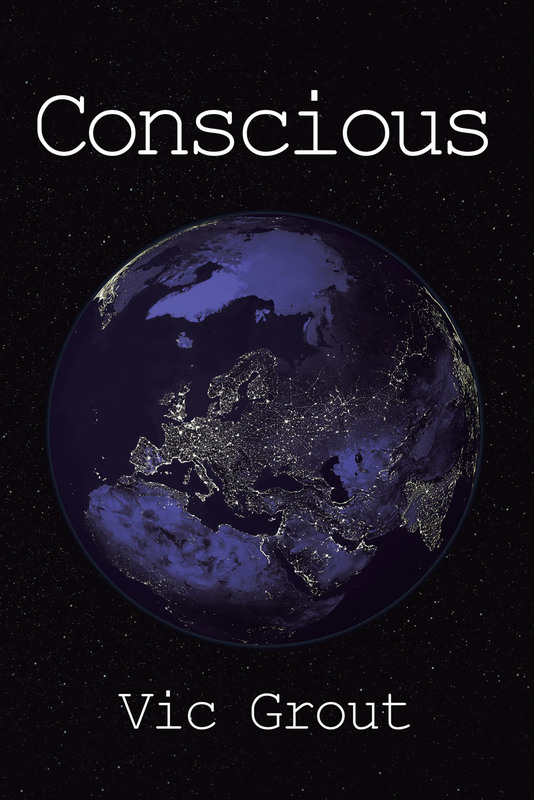 Having held senior positions in academia and industry for nearly 30 years, and published over 300 research papers and books on the Internet, Conscious is his first fictional novel. I first conceived the vague idea for this story about ten years ago. I had organised a public debate at Wrexham Glyndŵr University (then the North East Wales Institute of Higher Education) on ‘The Future of Computing’. Four ‘experts’, drawn from academia and industry, had been assembled into a panel, together with a distinguished chair to oversee proceedings. Each expert spoke on their particular topic for about ten minutes before the panel as a whole answered questions from the audience and allowed the discussion to wander where it would. The event was a partial success – probably no more than that. Other than setting the whole thing up in the first place and priming the chair with a few pertinent questions, should the conversation flag, I took little part in the evening’s proceedings beyond the role of interested spectator. However, at some point in the event, the conversation drifted – somewhat inevitably – towards machine intelligence. Although a well-trodden path indeed, a certain comment made an impression on me. It was simply that – in the opinion of the speaker, ‘some years into the future’ – the neural size of the Internet would reach that of the human brain. I had two immediate thoughts. The first was fairly obvious: that such a milestone in itself wasn’t particularly meaningful because the brain and a collection of logic gates were probably entirely different things. (I recalled watching a TV programme, which had discussed panpsychism, some years earlier but I couldn’t remember the term then.) Secondly, it struck me that that point would have already arrived without anyone realising it. If you added (multiplied) the circuitry of the individual devices (network routers, end PCs, etc.) into the basic topology of the Internet, then its overall neural count was many orders of magnitude higher. Whatever the fine detail, if the panpsychists had a point, then the Internet might be showing signs of life sooner than anyone expected! This story – at least the idea behind it – traces its origins back to that moment. I even wrote a few thousand words at the time. Unfortunately, life then got in the way. I had a growing family and a job that was proving interesting and fulfilling – but demanding. Nothing happened for several years. When I finally returned to the project at the start of 2015, my first impression was that I’d missed the boat: that the idea was already mainstream and the story had been told. People like Christof Koch were discussing panpsychism in relation to the Internet (having made those appropriate adjustments to the calculations, which had occurred to me years before) and Robert J. Sawyer had written the excellent ‘WWW’ trilogy. It looked like time to move on. However, having read the available material in a little more detail – both ‘fact’ and ‘fiction’, and the essential intersection of ‘speculation’, it became clear that this still wasn’t yet quite what I wanted to say. Firstly, the somewhat one-dimensional focus of the Internet panpsychists on neural complexity seemed a touch simplistic to me. Secondly, as entertaining as Sawyer’s ‘Webmind’ was, I couldn’t swallow the moral reliance on western political axioms or the general level of anthropomorphism throughout. It wasn’t that I necessarily thought it wouldn’t work out like that; I just couldn’t see how anyone could be sure – there didn’t seem to be any reliable foundation to base it upon. But, finally and most importantly, ‘emergent sentience’ in literature was always just really clever software; and I simply didn’t see it like that at all. To me, it would start with the hardware and take it from there. The software, if there even was any, would – at most – be an indistinguishable part of it (as it probably is in our own brains). So, although there was always Skynet (Terminator) of course, like Webmind and many other variations on the theme, this was AI that existed on or in something. I still felt the need to do something different: I wanted ‘it’ – the sentient ‘whatever it was’ – to be the something – the thing itself, not what lived on it, and I wasn’t actually bothered how intelligent it was – that seemed like a distraction. It was the idea of ‘it’ existing at all that interested me! At the same time, debate on the ‘technological singularity’ was beginning to be played out in public with a comparable array of unfounded assertions – for good and bad – appearing with increasing regularity. Also, the ‘Internet of Things’ was becoming a reality, which brought its own extra dimension to the story. ‘The Internet’ was suddenly no longer a separate entity, to be logged on to, as and when: it was everything – everything we do on Planet Earth. Everything was going to be connected! In one sense, certainly trying to consider all the angles, it all seemed a lot more complex to me; in another – any attempt at an underlying philosophy, say – just very uncertain; but finally, and paradoxically – in terms of the overall effect, somewhat simpler. Then, of course, there are some questions that go way beyond just the technology and we really should be talking about the bigger picture anyway. I felt that the whole story needed to be told on a different level, and that I might yet have a job to do. Only readers can confirm or disabuse me of that notion! I do, however, feel that a word of apology may be needed to hard-core computer scientists, particularly networkers (a group to which I have historical affiliations), and scientists, and technologists in general. In my attempts to make the story accessible for a wider audience, I’ve knowingly (and possibly unknowingly – I’m not sure which is worse) taken some horrible liberties with both hardware and software concepts in places and freely abused some scientific principles of scale and scope. This is generally true in terms of how, and where, some types of network activity might be measured, for example. My protocol discrimination – particularly wireless – has a fair amount of poetic licence too. Also, engineers will argue that some of the technological ‘side effects’ described couldn’t happen because our safety systems (for example) wouldn’t allow it. But I’m trying to make a particular point here; namely that our understanding of technology is often based on our assumptions and preconceptions and, to a great extent, custom. An independent intelligence may not be restricted by any of this and will be constrained only by the laws of physics (not just the ones we know). Other than that, I believe (within the normal operational parameters of science fiction) the basic premise of the story to be vaguely sensible but, to describe it in the detail necessary to satisfy everyone, would have taken a book three times as long. Please forgive me: my intentions are good! Similarly, events, places and institutions aren’t to be taken too seriously: they’re a convenient mixture of the real and made-up with a few geographical and historical – occasionally historic – reference points. Finally, if I can predict one likely and repeated question that’s going to be asked … No, this isn’t my serious prediction for the future. There are far too many unknowns, which is one of the main points I’d like to get across. The Internet not doing what it does in this story will discredit a particular narrow philosophy and this simple empirical analysis will continue. As we build larger, increasingly sophisticated – possibly more human-like – machines, some existing theories of consciousness, for example (panpsychism, powered neural complexity, biological structures, etc. ), may be disproved by the relevant technology not becoming self-aware at each stage when it’s built. At those points, it will always be interesting to consider the options we’re left with and where our revised philosophies may be funnelling us. This discussion is also the role of the central characters in the book, having their own various positions on this. Woven into the actual storyline in what follows, there are numerous other ideas, theories and opinions as to what consciousness really is, what machine intelligence may look like – or behave like, what our technological future may be, concerns we possibly should have and, ultimately, what it will mean for us. Any or none of these may be correct. Something will be, of course, but it may be just in the nature of things that we won’t know what until we get there. What’s definitely true though is that we should be talking about this stuff now and I don’t think we really are. The idea that we might be heading towards one or more technological catastrophes (or singularities, if you like) doesn’t seem particularly outrageous to me. This entry was posted on Monday, October 10th, 2016 at 7:18 pm	and tagged with Artificial intelligence, Big Connectivity, Big Data, Brain, Formal proof, Futurology, Internet of Everything, Internet of Things, IoT, Machine intelligence, Real Internet of Things, Science fiction, Singularity, Technological singularity and posted in Academia, Algorithms, Computer Science, Computing, Education, Engineering, General, Hardware, Industry, Mathematics, Philosophy, Politics, Programming, Science, Software. You can follow any responses to this entry through the RSS 2.0 feed.